The Para-Dyne amps are named for their two foot-switchable channels of extremely dynamic tone! 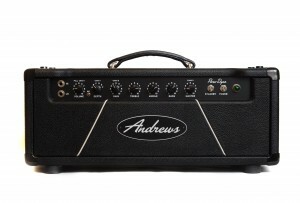 A huge range of tones is available and the amp maintains clear note definition even at high volume and gain levels. Channel one ranges from sparkling clean to classic overdrive and and loves pedals. Channel two can take you from warm and fairy clean to crunchy British tones, to smooth sustaining high gain. It’s compact size and reasonable weight makes it easy to transport and set up. A “triode/pentode” switch is provided on the rear panel to switch the power output to around half of it’s full power rating for smaller gigs. The super-durable construction is road tough and the Para-Dyne 25’s medium-low power output is perfect for all but the largest venues. A buffered and bypassable serial effects loop is standard. 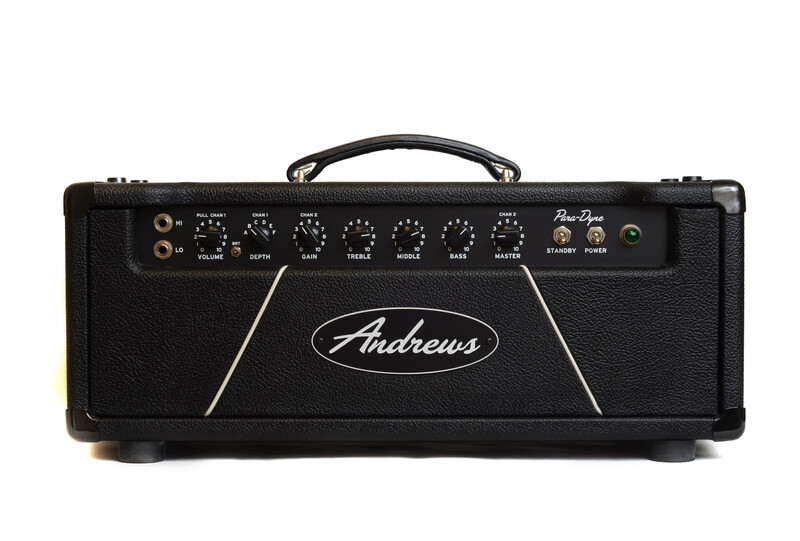 Like all Andrews Amps, the Para-Dyne has external bias test points and an adjustment control for making output tube replacement quick and easy. The Para-Dyne models are available in 50 watt and 25 watt models. We offer a choice of 2 speakers from WGS for the 1X12 combo, the Reaper HP and the ET90. The Reaper HP is loud and powerful with a sound like a Celestion Greenback mated with a G12H30 resulting in the classic British tone of a Greenback with a bit more presence and without the flubby bottom end. The ET90 is a little more flatter in the mids with a cleaner, less colored tone. Overall, the ET90 excels with clean tones and the Reaper HP, with it’s stronger midrange, wins the overdrive contest. Power output is switchable from 25 watts to 15 watts, powered by a pair of 6V6 output tubes and driven by three 12AX7 preamp tubes. The clean channel has classic warm tones and loves pedals. It features a six position Depth switch for adjusting the depth of the low frequencies. The overdrive channel is thick and warm with a lot of sustain while maintaining good note definition. Channel switching is available via the included footswitch (with LED indicator) or by front panel control. All hand wired construction with custom-designed welded steel chassis, extra thick custom turret board and custom made transformers and speakers. External bias test points and adjustment pot for quick and easy tube changes. Please check out our extension cabinets which are designed for the ultimate sound and look when combining with Andrews heads. Output power: 20 to 25 watts RMS switchable to “half-power”. 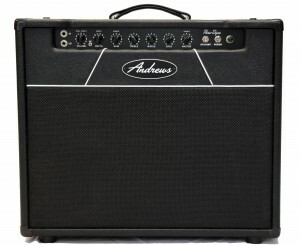 The Para-Dyne 1 X 12″ combo is just the right size to sound big without being too big or heavy to easily transport. It’s smaller and lighter than our previous combo designs but bigger than those mini combos that always seem to have a choked, “boxy” sound. Output power: About 25 watts RMS switchable to “half-power”. More samples and videos coming soon.